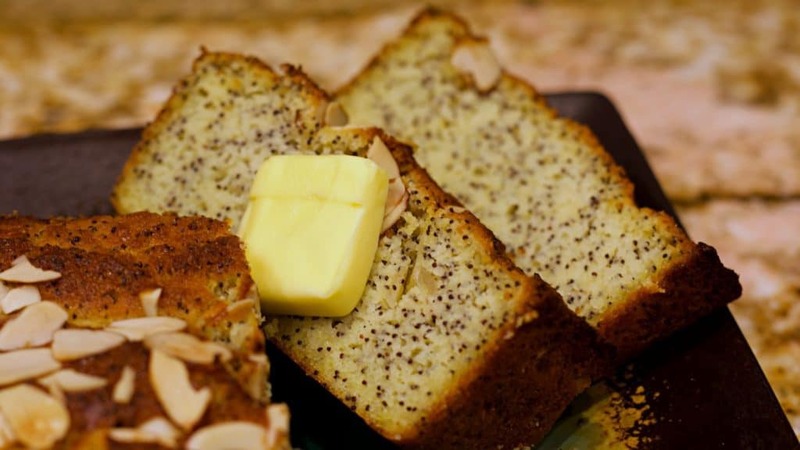 One of my favorite sweet foods for breakfast when I was living in Mississippi was the Almond Poppyseed Bread that the Mennonites would sell at roadside stands. This was one of their biggest hits, and I swear that everyone in town ate it for breakfast on the weekends. We would heat it up and then melt some Salted Butter on it and it was so delightful. 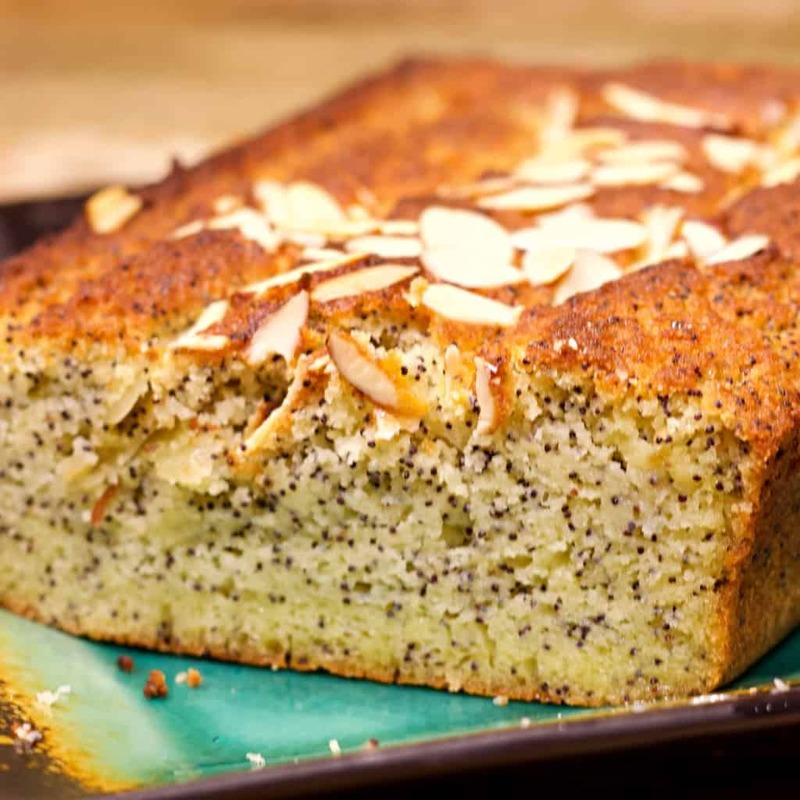 These days it seems that most people are eating Almond Poppyseed Bread from a box, and I figured it would be too hard to make a Mennonite replica that was Keto-friendly. Boy was I wrong! After spending the first few minutes in the oven the downstairs began to fill with a warm and delicious smell of Almond Poppyseed Bread baking. It didn’t take long for the kids to come down and start getting nosey, asking me what I was making and when we were going to eat it. My 5 year old claimed that she was going to have 5 slices all to herself (she would have eaten 3 at least if we had more, because she ate two slices like it was no big deal). This was just as good as any I have ever had in my life. You could also opt to put a drizzle of Heavy Whipping Cream, Salted Butter, and Monkfruit Sweetener on top if you want, but I left it out in this recipe when I baked it for the photos. I know that there will likely be a lot of questions about whether you can make Muffin out of this recipe, and YES you absolutely can. Also, if you want to try baking it with Almond Flour instead of the Coconut Flour you can do that too, but I prefer the texture of this being made with the Coconut Flour, as it tastes more like the original that way. Put the Coconut Flour, Poppyseeds, Lakanto Monkfruit Sweetener, Salt, and Baking Powder into a Large Mixing Bowl. Melt the Salted Butter, and Pour into Mixing Bowl with the Dry Ingredients. Add the Vanilla Extract, Almond Extract, Heavy Whipping Cream, Eggs, and Juice from the Lemon into the Mixing Bowl and Whisk, or Blend the ingredients together until evenly mixed. Pour the mixture into the bottom of the Loaf Pan and spread out until evenly distributed in the pan. Top with Sliced Almonds and bake at 350*F for 60 Minutes. (Can vary depending on Altitude) Just make sure not to burn the top, but you will want to make it nice and brown on the top. Let cool on the counter in the Loaf Pan for at least 5 minutes before attempting to remove the Almond Poppyseed Bread. If you plan to serve warm, slice desired amount right away. If you plan to keep this loaf on the counter, let cool to room temperature before wrapping in clear plastic wrap, or other preferred method of storage. SPECIAL NOTE: I do NOT recommend making this recipe with a straight up Stevia sweetener. If you do that, you will bake a bitterness into the bread that will not be desirable. That is specifically why I use the Lakanto Monkfruit Sweetener as it has a predictable taste after baking. There are some Stevia blends out there that feature primarily Erythritol as the main ingredient, and those are generally acceptable if that is the type of sweetener you prefer to use. Only 1/2 cup of flour, and this recipe will make 10 slices of almond bread? Huh. I guess I haven’t baked enough keto to realize this. Although, with six eggs, this seems like mostly an egg loaf. Guess I’ll have to try it to find out. Looks delicious! Coconut Flour is something else. It doesn’t work like Wheat Flour at all. Even though there is a good amount of eggs, it wont seem like a quiche or anything like that. Those are really for the substance. Yep, you just need to use about 2-3 times as much as a replacement. I’m confused.. if I use almond flour how much I supposed to use..? Typically 3 times as much as Coconut Flour. Coconut flour is cheaper than almond flour & goes farther, I love finding a sweet recipe that uses it. It’s delicious. we had it for bkfst today.it was wonderful. We loved it. thanks for sharing. Hi! Would would be the equivalent measure of organic cane sugar instead of the monk fruit? My body can’t tolerate erythritol and I’m still researching pure monk fruit. Thanks! Bete Primm, have you tried stevia, a natural noncaloric sweetener? It’s a glycoside, not a sugar alcohol. But test it carefully to be sure that you’re not allergic to it. I bet this would make nice keto muffins! Can you sub the butter for something healthier? Coconut Oil could be a good replacement. Butter is VERY healthy – especially if it’s made from organic milk from grass-fed cows. Can you sub Swerve with the same measurements? Have you tried using coconut palm sugar? can I leave out the poppy seeds? What about xylitol? I’m new to Keto and think that this would be a great bread to make. I think a lemon drizzle of some sort would be a nice topping. Any ideas? This was the perfect keto-friendly bread for me today. I had to bake an apple loaf for the family get-together tonight. The smell of it cooking was so fantastic I knew I’d never make it through the night without having a piece. 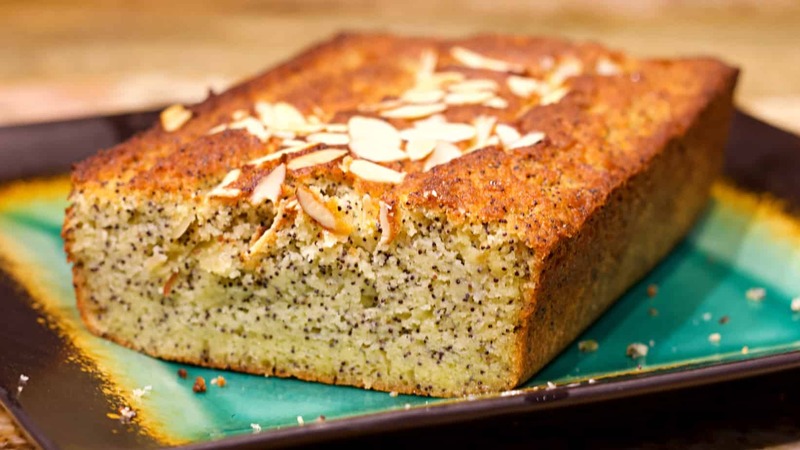 So the second the apple loaf came out of the oven, your Keto Almond Poppyseed Bread went in. I’ve got the fixings for the lemon drizzle standing by just as soon as it is cool and ready. I don’t know about a life-saver, but it’s definitely going to be a diet-saver. Can I use chia seeds instead? What will happen if I use less eggs? Say three. Three eggs is not enough, as even normal poppyseed bread made with traditional flour calls for four eggs. Chia becomes very gelatinous when wet. so I can imagine that the texture would be quite different if you use those. I can tell you that if you stick the recipe it turns out great though! I made this loaf today and it was amazing. So moist!!! I’m new to keto and this really hit that sweet tooth I was having. Great of a little snack. Happy to hear that you enjoy it too! Awesome! I’m really glad you liked it. I made this and it made my house smell wonderful. The texture was perfect but I found it a little too salty. I later realized that I put in the full 10 TBS of butter instead of 9. Do you think this made the difference in the extra salty flavor? Anyway, it was still good and I will be trying again. Thank you for the recipe. I used salted butter in mine, so I don’t think that extra TBSP would have made it too salty. You could always try using Unsalted Butter next time and then just adjusting the salt to your liking. It does make the house smell good! My kids came downstairs when I was baking this to ask when we were going to eat it. This looks really delicious! I wanted to make some extra ahead of time for a quick breakfast grab. Other things I’ve made with Coconut flour tend to have a short shelf life. How long do you think this will keep? Also should I keep it in the fridge to maintain freshness? I made it but it has a very bitter taste. I do not know what could have caused it. What type of sweetener did you use? Can I use oat flour, and how much. I don’t use oat flour personally. I’m sure if you are just attempting to make it Gluten-Free that would work. Would you have any idea what amount of stevia I would use if replacing the monk fruit? Staying away from as much sugar as possible. Also, would I decrease the amount of butter to account for the lack of dry ingredient from the sugar? Just was the note about stevia, so no need to respond. Thanks. I made this last night and it is absolutely delicious! Mine turned out very crumbly. What could have gone wrong? I followed the recipe exactly, even taking it out of the oven a few minutes early because my oven runs a little hot. The taste is on point. Any clues? I loved this so much! I was able to get everything I needed that was keto oriented from Amazon and it was super easy to make. I’m going to have to hide this from the kids (teens). Thank you so much! Mmm this bread was so delicious! I tried to enter it into myfitnesspal though and it said it had a lot more carbs than are listed. Do you know why that would be? The MyfitnessPal app does not properly calculate the carbohydrates of monkfruit or erythritol. It lists its weight as carbs, when there are no net carbs from it. They do not enter the blood stream. OMG!! This just came out of the oven & it’s hands down the BEST bread recipe i’ve EVER made for keto! I used 2 cups almond flour instead of coconut flour… DELICIOUS!!! Really glad you like it Jaime! So how many net carbs per slice would this be? I am new to keto but will be making this tonight! Is the lemon juice necessary? I looked could not find any comments? If I leave it out do I replace with a different liquid? Can you just Erythritol? Will it have a grainy taste or should I grind it finer and make powdered aerythritol? You can use Erythritol. I didn’t find the bread to be grainy at all, but Lakanto’s Monkfruit and Erythritol blend is very fine grain I think. I have made the poppyseed bread and we love it! I made some yesterday and the eggs went to the bottom and ended up as a layer of baked egg at the bottom. This morning I made another loaf being very careful. It turned out the same. Any ideas? That is really strange that they did that, as it has not happened to me. Did you bake it straight away after mixing the batter? I just made it. It’s just so delicius, I love the poppyseed. I make two more for my friends in Keto and Low carb diet. Can you help me with the math? 2/3 cup of monkfruit sweetener is 32 teaspoons. One teaspoon of monkfruit is 4 g carbs. So 32 teaspoons c4 carbs per teaspoon equals 128 carbs. Ten slices of bread per loaf means there are at least 12.8 carbs per slice just from sweetener. What am I miscalculating? The 4g Carbs listed for the Monkfruit are not effective carbohydrates. There are no calories, blood sugar effect, or anything from the Monkfruit or Erythritol. They list them because it weighs 4g and Erythritol is considered a Sugar Alcohol, but it has the lowest glycemic index rating and is not a Net Carb. Of course I tried this. Used all ingredients listed. I doubled the recipe and used an angel food cake pan. I did not use a tablespoon of the vanilla or almond extracts. I used a teaspoon and that was plenty. Any time I use a lemon I also zest it into the batter. I also made a change by seperating the eggs and whipping the whites to soft peaks and folding them in at the end. I did get some extra air in the cake as it baked. The best part was getting it out if the oven and flipping it upside down in the angle food pan. It did not compress after cooking! What a great treat ! How much lemon juice? Instead of juice from lemon. We LOVED this bread. I doubled the recipe and baked in a Wilton angel food loaf pan. Making it again for Easter weekend. Yum! Hi Jackie, the recipe has half a lemon in it already.